When Michele Hoover, General Manager, Tile Outlets of America, Fort Myers, FL, informed me in June that her store's bathrooms would be remodeled in October, I had my fingers crossed that the project would be done in time for Bathroom Blogfest 2012. C.B. : Michele, tell me about yourself and your background. MH: I was born and raised in Pennsylvania where for 3 generations my family owned a textile manufacturing business. I graduated from Bloomsburg University with a BS in Business Management/Accounting and went immediately to work full time in the sewing factories. I started working for Tile Outlets of America in September 2002, a few weeks before the store opened for business, as the Fort Myers store accountant. I always joke that I went from textiles to tiles. I later took on the Tampa store accounting as well as corporate accounting. In July of 2011, I became General Manager of the Fort Myers store and was excited to put into place all the things I’d accumulated over the years of helping the managers in both stores. I still function as Controller and oversee the accounting functions for both stores. I love being part of TOA and think of it as my own. I guess that comes from being brought up in a family business and the fact that Don Aronin and Warren Lampert have given Tile Outlets of America the same feel as a family business. C.B. : Michele, why did Tile Outlets of America consider this bathroom makeover important? The remodel is a project that has been discussed numerous times over the last 5-7 years. It was clearly something we’ve known needed to be addressed. The comments that registered to me the most came from a young brother and sister (approx 8 – 10 years old). Each came out of their respective bathroom and the sister commented on how pretty the hallway was outside the restrooms. The brother responded back “it’s a whole lot better than the bathroom”. And the sister responded “yeah, not so good for a tile store”. If the condition of the restrooms was that apparent to kids, they were obviously a disappointment (to say the least) to our adult customers. I think for most people the first room that comes to mind when initially thinking about tile is the bathroom and it is the one area of the store where we hadn’t done a good job of inspiring or showing our products and their possibilities. C.B. : What was the reaction once TOA's bathroom transformation was complete? MH: For me personally, my first reaction was pride. After years of being embarrassed by the restrooms I am so proud of how wonderfully the project turned out. I truly feel like for commercial restrooms they could rival some upscale hotel type lobby restrooms. All of our associates are as impressed as I am. Repeat customers and contractors who were witness to the transformation are blown away. 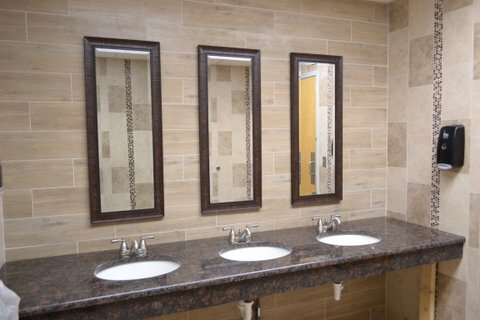 New customers are commenting on the beauty of the restrooms. The male associates are a little jealous that their restroom isn’t quite as elaborate as the women’s. And of course in good fun, the women make sure the men know they are missing washing their hands under a waterfall faucet into a travertine vessel. I don’t think anyone could be more pleased with the completed project. C.B. : How have the remodeled bathrooms improved the Tile Outlets of America retail experience in the Fort Myers store? MH: The restroom remodel completed the flow from the Inspiration Center through the back hallway. Now the positive ideas flow right into the restroom where as before entering the restrooms off the Inspiration Center surely interrupted “dare to dream” mode and returned customers to reality sooner than we would have liked. Even though the old restrooms were cleaned three times a week by an outside service they never felt clean because of the worn condition. I think generally customers relate the cleanliness and overall condition of the restroom to the rest of their visit and the type of service they expect to receive. Now customers can enjoy bright, clean, and stylish restrooms. C.B. 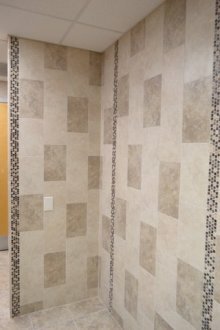 : How do the remodeled restrooms help Tile Outlets of America sell tile? MH: When choosing our designs for the restrooms we took numerous things into consideration. Of course product selection was important but we also wanted to show different ways to install products to truly inspire and spark creativity in our customer’s minds. 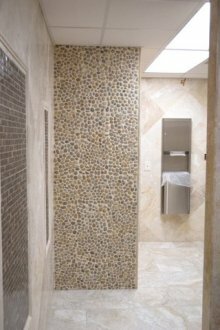 We used travertine, porcelain, glass, pebble stone mosaics, glass bridge mosaics, porcelain planks, split face mosaics, etc. 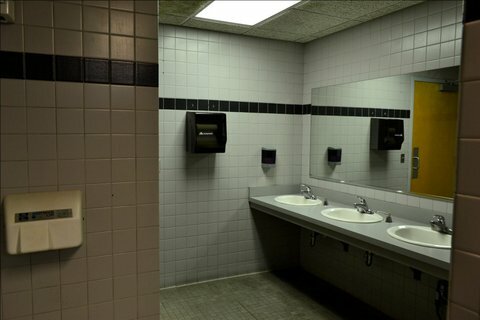 We featured on the wall behind the vanity/mirrors in the men’s room a porcelain wood plank tile that many people would only think of putting on the floor. 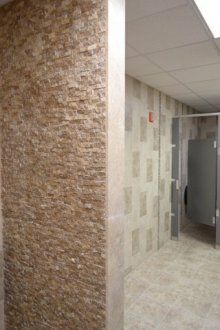 In the ladies’ restroom we combined porcelain floor tile with 18” travertine point set on the walls to show that you can combine the two in one job and to show how a large format tile looks on the wall. These are just a few of the design concepts we used to show the diversity of the products. We have already seen the increase in sample and job lot sales on some of the products we have selected. We also have a steady stream (no pun intended) into the restrooms of customers looking for ideas and to see how the products we used look in a finished project. They have become a great sales tool for our sales reps. You can now expect to see sales reps holding the door to the bathroom open while a couple is in them looking for ideas. 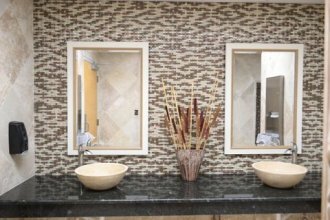 The restrooms have become an extension of the Inspiration Center and another way to help customers visualize what they can do in their homes. C.B. : Michele, that is fantastic! Congratulations! We started the project by demolishing the men’s restroom on Sunday, Sept, 16th. The demolition of the women’s restroom occurred on Friday, October 5th. The completed women’s restroom went into use on Thursday, October 18th. Both restrooms were gutted to their studs including all the plumbing fixtures, ceiling tiles, etc. During the install we turned the other restroom into a unisex restroom with a lock. We had two last minute emergency product modifications that had to be made in the women’s restroom. Both new products ended up as excellent substitutes. The installer for the Tile Outlets of America Fort Myers bathroom redesign was Jesse Decicco of Majestic Enterprises. Majestic has been in partnership with Tile Outlets of America, referring customers to us and vice versa for as long as the store has been open. Jesse takes great pride in his workmanship and has a great eye for design. He is the type of installer who will walk his customers through their remodel step by step starting with product selection. He goes above and beyond simply laying tile. C.B. : Thank you, Michele! What a terrific success story to share for Bathroom Blogfest 2012! I hope everyone who reads about Tile Outlets of America's new bathrooms in the Fort Myers store will go visit and be inspired to recreate similar designs.